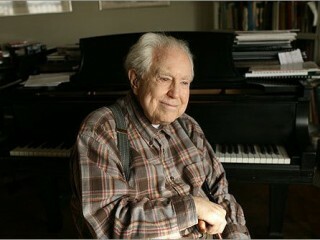 The American composer Elliott Cook Carter, Jr., developed an individual musical style, courageously ignoring many of the passing musical fashions to become one of the most respected composers of his time. Elliott Carter was born in 1908 in New York, the son of a wealthy businessman. He was an English major at Harvard and, encouraged toward a musical career by his friend and mentor Charles Ives, he took his master's degree in music there, then spent 3 years in Paris studying with Nadia Boulanger. His first compositions, written upon his return to the United States, were a neoclassic ballet, Pocahontas (1939; rev. 1941), and Holiday Overture (1944). Carter's Piano Sonata (1945-1946) is generally considered the first example of his mature style. It is highly dissonant and rhythmically complex, characteristics of all of his subsequent compositions. In his Sonata for Cello and Piano (1948) there is no attempt to "blend" the two instruments; each seems to go its own way. This manner of combining instruments is also used in his first String Quartet (1951-1952), in which the four instruments are treated like individual soloists, not sharing the same musical material. "I regard my scores as scenarios," the composer once said, "for performers to act out with their instruments, dramatizing the players as individuals and as participants in the ensemble." In this piece there are also examples of "metrical modulation," a method devised by Carter for precisely changing from one tempo and meter to another, giving a subtlety and flexibility to the time dimension of his music not achieved by other composers. Variations for Orchestra (1955), a second String Quartet (1959), and a Double Concerto for Harpsichord, Piano, and Two Chamber Orchestras (1961) are later examples of his complex style. "I have tried to give musical expression to experiences anyone living today must have when confronted with so many remarkable examples of unexpected types of changes and relationships of character uncovered in every domain of science and art." The Piano Concerto (1964-1965) continues the explorations of new tonal and temporal relationships. The composer described the piece as a "conflict between man and society. The piano is born, the orchestra teaches it what to say. The piano learns. Then it learns the orchestra is wrong. They fight and the piano wins—not triumphantly, but with a few, weak, sad notes—sort of Charlie Chaplin humorous." In his Concerto for Orchestra (1969) Carter achieves his complex texture by dividing the orchestra into four sections, each one different in composition and complete in itself. Much of the composer's music since the 1970s took the form of solo and chamber works. His A Mirror on Which to Dwell (1978) is a song cycle based on the work of American poet Elizabeth Bishop. His String Quartet No. 5 was premiered by the Arditti Quartet in Antwerp, Belgium, in 1995. The same year also saw the premiere of a new song cycle, Of Challenge and Of Love. His later orchestral works include Three Occasions (1986-89) and his enormously successful Violin Concerto (1990). The latter piece has been performed frequently in more than a dozen countries. His Partita was commissioned by the Chicago Symphony Orchestra (1994) and around the same time his Adagio Tenebroso was commissioned by the BBC Symphony Orchestra for the 100th anniversary of the BBC Proms. Carter has remained active well into his 80s. He has twice won the Pulitzer Prize and was the first composer to receive the United States National Medal of Arts. Carter was one of only four composers to win Germany's Ernst Von Siemens Music Prize, and in 1988 he was made a commander in the Orders of Arts and Letters by the French government. Among his other honors were Guggenheim fellowships, UNESCO citations, and several honorary doctorates. His compositions are performed and recorded as soon as they are completed. "I write for records," he said. "My last three pieces run about twenty-five minutes—the length of an LP side. They should be so rich that they can be played many times." It is this richness that makes a first hearing of Carter's music a confusing experience for many listeners, and the chief reason why it has not found popularity with a general audience. View the full website biography of Elliott Carter Jr..